Romantic trip to Warsaw - where to go? There is a famous quote “If traveling was free you would never find me again” and if this traveling is with someone whom you love then it becomes part of our memories even if the person is not with us. The person always remains close to your heart because of these small trips. If you have ever visited Warsaw then you will surely realize this thing. Warsaw is the capital and the largest city of Poland. It stands on the sides of Vistula River and is only 260 kilometers from the Baltic seas and 300 kilometers from the Carpathian Mountains. It is also described as the Paris of the East and has been one of the most beautiful cities in the past. But after the German invasion during Second World War it was completely damaged and after that, they completely reconstructed themselves because of which it gained the title of Phoenix city. Paris is described as City of Love and Warsaw is considered Paris of the East because of its romantic atmosphere. It is on the top of the list of the romantic destinations in the world. There is a saying in Warsaw “Warsaw is ever-changing but is always true to its lovers”. Once you travel through Warsaw you will realize there is something different about Warsaw from its old Market Square to its fascinating architecture. If you travel across the city even though it has the worst history but still it has beautifully captured its diverse architecture, culture and most importantly its spirit to live beautifully. It has a beautiful collection of neighbourhoods and landmarks which leave an everlasting effect both on your heart and mind. If you love food then always remember Warsaw’s restaurants are the best ones in Poland. 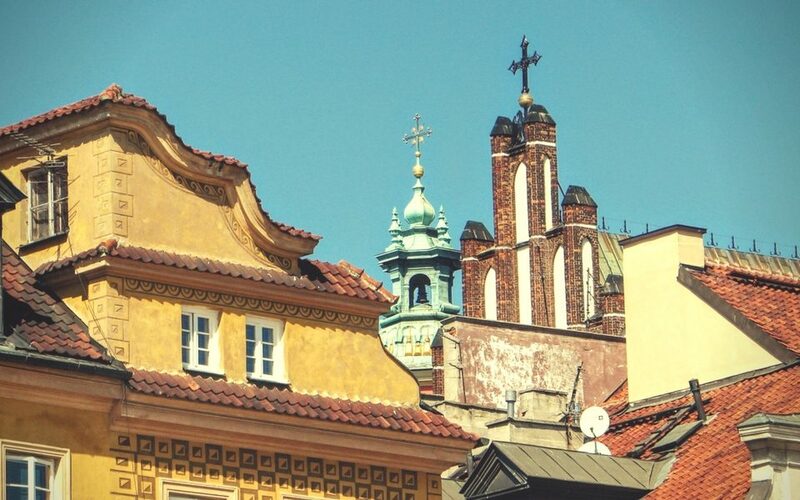 Here are some tips on where you should go during a romantic trip to Warsaw. It is just opposite to the Soviet Palace of Science and Culture and visitors visit here to have a view of the city from its 40th floor. It is one of the highest points of the city from where you can view the entire city. If you are going with your partner, then ignore the crowd of the bar, get a drink and look to the shining Warsaw in the light of night. It is situated right next to the Royal Castle which has a beautiful interior which depicts the cultural beauty of Warsaw. But don’t stop at the interior only, go to the terrace and enjoy the beautiful light at sunset. It is one of the best sightseeing points in Warsaw. It was constructed in 1955 by Lev Rudnev in “Seven Sisters” style and is informally considered as Eighth Sister. It is the tallest building in Poland and 8th tallest in Europe. It consists of various companies, concert halls, cinema halls, libraries, scientific institutions and everything else you would love to visit. It is also famous for its sightseeing from the terrace and you should never miss this place if you are present in Warsaw at the time of Christmas. This is one of the most beautiful places to visit in Warsaw. While you are walking the streets from Old Town to New Town, you can enjoy a walk far away from bustle of central city life. Its musical atmosphere, theatrical performances and open-air galleries create a unique sense of history. It is known by the name of “Zamek krolewski” in Polish language. It was the former residence of Mazovian princes. It was completely destroyed in 2nd World War and was rebuilt in 1988. Its main attraction is its Museum which has two original Rembrandt paintings as well as paintings from Bernard Bellotto. This is among some of the few buildings which survived the 2 world wars. This place is considered as the symbol of love and one can read the love letters written by Polish King Jan III Sobieski to his wife Marysienka. The palace is surrounded by a beautiful garden and couples visit this place to take a romantic walk and take a few minutes break from their never stopping urban life. If you are considering a romantic trip to Warsaw, you can't forget about the Love Bridge. t is considered as the most romantic and the hidden gem of Poland. It is the best place to visit in the night. The bridge is surrounded by three hearts and according to tradition couple visit here to throw keys in the river.